In this tutorial, we will learn about how to use Hibernate to perform CRUD operations on database. We will be using MySQL database. Let’s get going. Model class Student is a simple POJO class which we will be mapping to a database table(created is step 1). It’s a good practice to override hashcode and equals method. It becomes even mandatory when working with collections or detached instances. Hibernate manual contains a detailed description about them. 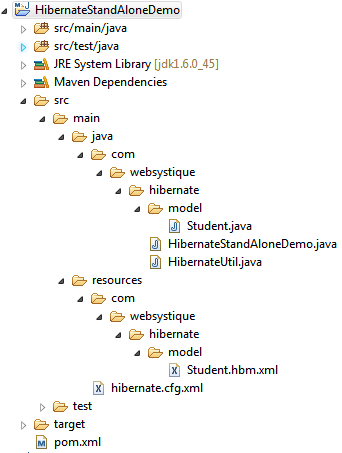 To instruct hibernate to save instances of our Model class, we need to help hibernate about how classes and fields should be mapped to Table and Columns in database. To do that, we will create a mapping file Student.hbm.xml. Since it’s not a java file, we can create it in src/main/resources folder as shown in project structure diagram above. 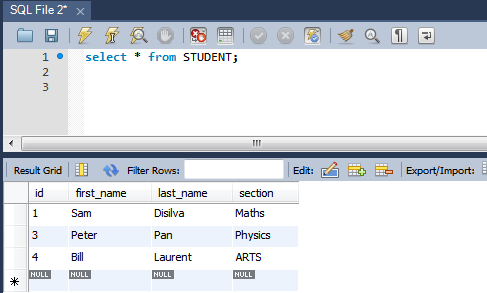 Above file tells hibernate that class Student should be mapped to table STUDENT in database.Properties firstName,lastName & section of class Student will be mapped to columns FIRST_NAME, LAST_NAME & SECTION in database respectively.Id tag maps id property of Student class to primary key of table and with native generator instruct hibernate to choose any of sequeance, identity or hilo algorithm to generate the primary key. We need to inform hibernate about how to connect to database, which database dialect we will be using so that hibernate can generate the instruction specific to that database and what all mapping files we would like hibernate to keep an eye upon.